Artistically Invited is an online invitation shop with a personal and easy ordering process. Purchase your modern and rustic invitations and cards through an easy online ordering process, knowing that you will have a complimentary one-on-one proofing process with the Designer. Customer service is a top priority and completely genuine. 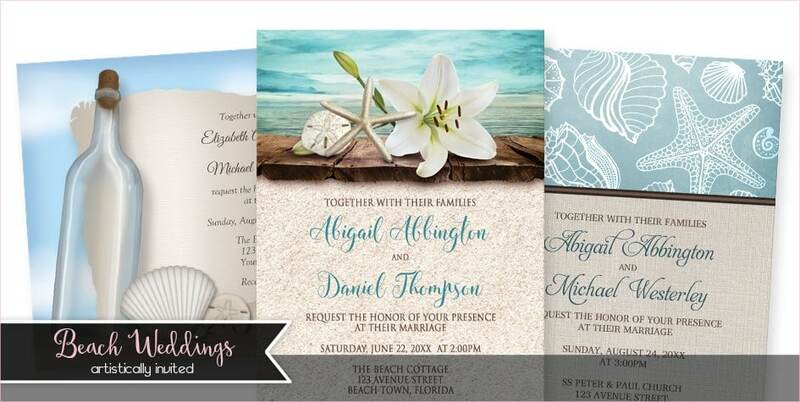 You'll be emailed a proof image of your invitations with the details you provided at checkout, before they are printed, and be able to make any changes if necessary. Shop for your modern and rustic wedding invitations, reception only invitations, and invitations for bridal showers and couples showers. Order your unique invites for baby showers, birthdays, Christmas, housewarming parties, and family reunions. You will also find save the date cards, thank you cards, and upgrades to add enclosure cards with your invitation order. Complimentary proofing process with the Designer. Professional quality printing and paper stocks. Affordable. Bulk discounts are available. "I ordered invitations for a bridal shower and the turned out beautifully! I couldn't have asked for anything better. Perfect and they came so quickly! Thank you so much for your help! I will definitely order from you again!" ~ Corey F.
"Thank you very much for the beautiful bridal shower invitations. The bride was very happy with the end product. Thank you again for the amazing quality and immediate support when changes needed to occur." ~ Crystal C.
"Amy was a pleasure to work with. 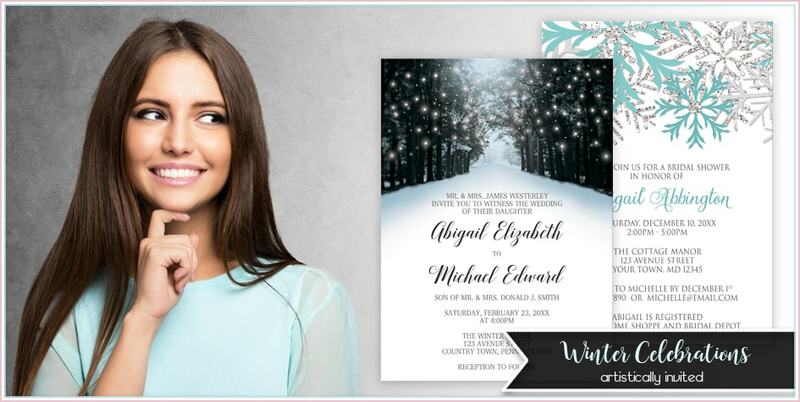 We had a few questions regarding the personalization of a bridal shower invitation; she was very quick to respond with the online chat option through the website - how convenient! We received the proof in less than 24hrs and received notice they were being printed and then shipped - all in less than a week. The turnaround was so quick! We also ordered matching thank you's and they were all shipped together; another convenience. I would not hesitate to order from Amy again - the quality is stellar and at a fraction of the cost of some big name stores" ~ Marie S.
NEW! Pay over time for your purchase. How does buying your invitations online get even easier? When you can pay over time using Klarna! Now available as a payment option at Artistically Invited, Klarna has an application process that's ridiculously simple. Choose Klarna during checkout as your payment method to apply. How it all works: Browse the occasion or card category you need to find your perfect design. Select the quantity and paper type (if a choice is available) that you need for your invitations or cards. Fill in the relevant fields on the product page to include your personalization details with your purchase. Within 1-3 business days you will receive (by email) a proof image that requires your review and approval. This one-on-one proofing process with the Designer is complementary! This ensures that the invitations will look just like you want them to. Once the proof image has been approved by you the printing will begin on your invitations, announcements, and/or cards. Folded cards with no personalization options do not require this proof image and approval process. See an invitation design you really like, but not for the occasion you need? Simply provide the wording you want to use! Please email me if you have any questions. Beach Wedding Invitations from Artistically Invited. Modern and rustic style wedding invitations. Take a look to learn more about the paper types and envelope types currently offered at Artistically Invited. • 19pt Savoy Cotton White. Envelopes: White, Cream, Ice Pearl, Savoy Cotton, and Kraft. As always, bulk discounts are already in place for larger print orders. The more you order, the more you save! FREE SHIPPING is available on every order shipping to the USA. Most packages (invitation and card orders) ship via USPS Priority Mail. Other stationery items ship via standard shipping methods. If you ever need a different quantity that isn't listed of any given invitation or card, please email me or use the chat window and I'll be happy to see if your request can be accommodated. Minimum orders are required.